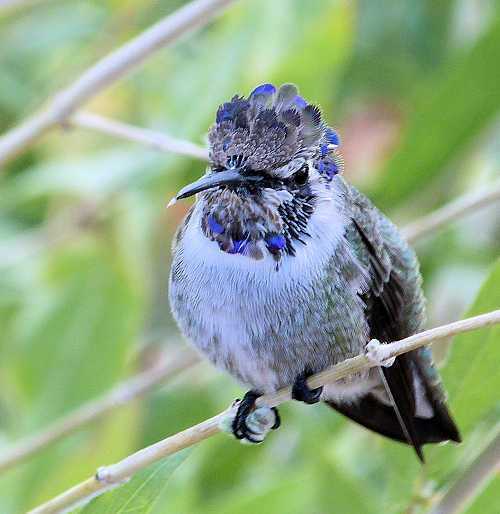 Attracting hummingbirds in hot, dry climates. gardening. Select a combination of flowers, shrubs, bushes and trees that bloom throughout the year. Provide evergreen shrubs and small trees with horizontal branches for hummingbirds to hide when they are resting. These should be 25 to 50 feet away from flowering plants with a clear view of the flowers. Include plants that tend to attract many small insects from which hummingbirds can get their daily protein, vitamins and minerals. Small insects and spiders comprise up to half of a hummingbird's diet. These include aphids, whiteflies, ants, mosquitoes and fruit flies. Avoid spraying pesticides and herbicides. These will poison hummingbirds. Systemic herbicides show up in flower nectar. If you feel a pesticide is necessary, grind up two Habanero chili peppers and two garlic bulbs in a blender with one-third cup of water. Strain out the solids and you have a concentrate. Add one-quarter of the concentrate to one gallon of water and spray the plant. This mixture will not harm any bird. Hummingbirds make their nests using alternating layers of spider webs and cottony plant material. Leave the spider webs for the hummingbirds between February 1 and June 1. Kill only very poisonous spiders such as the black window and desert (brown) recluse. Hummingbirds like misters even more than birdbaths. Clip a mister nozzle on the top of a tall shrub pointing straight up. Hummingbirds will fly through the mist, perch on leaves in falling mist, and drink from the water droplets on leaves formed by the mist. To save water, put the mister on a timer that turns on for one hour twice a day. Keep the mister at least six feet off the ground to avoid cats. See Hummingbird Feeders / Critter Problems. Orange-red, tubular flowers arrayed on spikes, edible. Orange to red, tubular flowers. A climbing vine with showy, colorful flowers. Large, fragrant flowers, purple, pink or white. Reddish-orange flowers 1.5" long in clusters. Blue tubular flowers. Blooms most of year. Tubular flowers in red and other colors. Red, tubular flowers, 3" long, in clusters. Red bracts in slipper-like shape contain flowers. Very spiny green canes. Orange to red flowers 1" long in clusters at top of canes. Reddish tubular flowers, with yellow throats, hang from narrow spikes on stalks up to 6' high. Reddish tubular flowers. Blue-green, succulent-like stems. Orange-red tubular flowers with yellow throats, 2" long. Tubular red flowers. One of the easiest Penstemons to grow. Longer blooming. Red to red-orange tubular flowers arrayed on spikes. Bright red tubular flowers, 1" long. Blooms on and off from spring into fall, depending on rain. Easy to grow. Fragrant, light pink to white flowers in clusters. Dark pink to magenta tubular flowers with flared lobes. Magenta flowers, 0.75" long in spikes. Dark pink, red or orange-red flowers, 0.75" long in spikes. Bright red flowers, repeat blooms most of year. Red flowers, 1" long, repeat blooms most of year.